In spite of its sweet smell and historical use as an anesthetic, chloroform is quite toxic and presents a health hazard to humans, whether inhaled, ingested or even touched. Not only is it dangerous to humans, it's also an environmental hazard as it reacts with oxygen and sunlight to form a toxic gas called phosgene. Chloroform is a heavy liquid and easily leeches into groundwater when not disposed of correctly; therefore, proper disposal is extremely important when dealing with chloroform. Do not attempt to dispose of chloroform yourself. Disposal entails a complex process that includes incineration via admixture with combustible fuel, followed by an acid scrubbing to remove haloacids. Contact your nearest hazardous waste facility to have the chloroform professionally disposed of. Dispose of empty chloroform containers, such as bottles, tubes and pipette tips, just as if they were normal trash. Federal guidelines define an empty chloroform container as one that has been emptied by normal means (like pouring, pumping and aspirating), and has residues no greater than 3 percent by weight of the container's capacity. Containerize other materials that may have absorbed an unacceptable amount of chloroform. Have the containers disposed of by a professional hazardous waste facility. 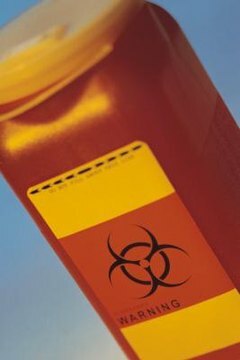 Regulations define hazardous wastes as materials that contain chloroform at a concentration of 5 mg/Kg. At this ratio, a pound of debris that has absorbed approximately two or more drops of chloroform should be professionally incinerated. David Johnston works internationally as a freelance writer and editor in a number of professional fields. He received his bachelor’s degree in English from the University of Colorado at Colorado Springs. Johnston, David. "How to Dispose of Chloroform." , https://legalbeagle.com/12000244-dispose-chloroform.html. Accessed 19 April 2019.